As a vegetable globe artichokes (Cynarascolymus) are considered a gourmet delicacy. As a garden plant, the spiky silvery green foliage is striking and unusually beautiful. But as a herb, would you guess that it is one of the most effective and far reaching natural liver tonics that one can grow? The most effective part of the plant is its leaves, which are bitter, and contain cynarin which protects the liver against infections, and stimulates its detoxifying action against toxins, like alcohol. A simple age-old Mediterranean recipe uses fresh artichoke leaf juice combined with water as a liver tonic. The bitterness of the leaves stimulates the production of bile that is useful in the treatment of gall bladder problems, nausea, indigestion, constipation, and abdominal pain and bloating. It also lowers blood cholesterol, blood pressure and blood sugar levels, making it a good food for diabetics. As a diuretic, artichoke is used to treat rheumatic conditions. It helps to restore natural bowel flora, which helps to counteract the side-effects of antibiotics, has anti-inflammatory properties and is a strong anti-oxidant. For medicinal uses, artichoke leaves should be picked before the plant flowers. The leaves can be dried or used fresh as an infusion or juiced. A tincture of the leaves (with vodka as the preservative) provides a concentrated preparation with a longer shelf life. The dosage for dried leaves is 5g a day, and for a tincture 5ml three times a day. According to the Greek physician, pharmacologist and botanist Dioscorides (1st century AD) mashed artichoke roots could be applied to the armpits, and anywhere else on the body to sweeten offensive odours. Globe artichokes may be one of our very early hybrids because it has only ever been cultivated, and was thought to have been bred from the closely related cardoon (Cynaracardunculus). The Greeks and Romans grew it as a vegetable but it only became widely cultivated in Europe from the 15th century near Naples. Its popularity spread to Florence and it became a favourite dish of the Medici family. A century later it was introduced to Britain as a culinary and ornamental plant. Artichokes are short lived perennials that should be replaced after three years. The second and third years are their most productive. To grow into their full size they need plenty of space. Each plant grows up to 1,8m high and almost as wide. The effect is magnificent, whether in the flower, herb or veggie garden. They grow best in full sun, in well composted soil that drains well. They do not like heavy, clay soil. Each planting ‘station’ should be dug over to a depth of 25cm; compost mixed in and formed like a shallow dish. Once established, plants need very little attention; just regular deep watering, mulch, weeding and the removal of dead leaves. Work compost into the soil once a year and feed with a balanced based fertiliser in spring. Fertilise about 15cm away from the centre of the plant. Plants will tolerate frost but not where temperatures are consistently below minus in winter. 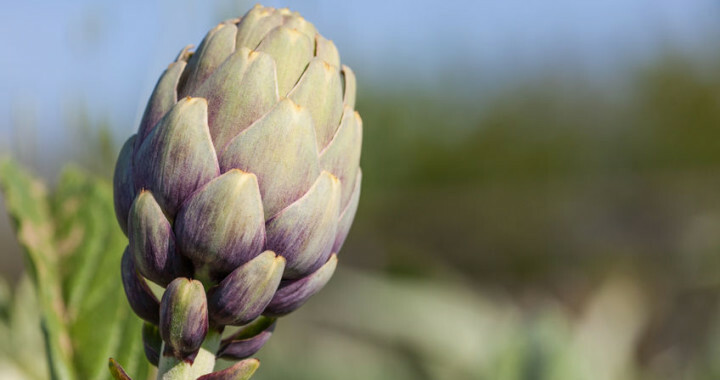 Good to know: To produce big, succulent buds, artichokes need plenty of water while the buds are forming, especially during a hot dry spell. At the end of the first year the plant will produce small buds which can be picked and eaten or left to flower. From the second year, many more buds will be produced and will be larger. It is possible to harvest up to 30 flower heads a year. The flower heads should be picked before the bracts start to open. The flavour of an artichoke is not dependent on maturity like a tomato. Pick each bud with a 10cm stem. If not being eaten immediately, artichokes with their stems can be put in a jug of water, like flowers. Those without stalks can be wrapped in plastic cling-film and kept in the veggie drawer in a refrigerator for a few days. Why not allow one of your artichokes to flower. They will be inedible but bees love the magnificent peacock-blue thistle flower heads. The heart is the greatest delicacy and it can be baked, fried of marinated. The fleshy base of the bracts is also eaten. The unopened flower heads are simply boiled, then turned upside down and drained. To eat, peel off the bracts and dip them in melted butter, hollandaise sauce or vinaigrette dressing and pull them through the teeth to draw off the tender meat. Baby artichokes (from side shoots) are eaten whole, pickled, or preserved in oil. Young leafstalks, known as artichoke chard, can be blanched and eaten as a vegetable. Posted in Culinary, Growing Herbs, Healing Herbs and tagged artichokes, culinary, flavour, growing, health, Herb Gardening, herbs, medicinal, tips.